The LG G6 was inspired by the 18:9 philisopphy of epxerts in the movie industry that believe thata 18:9 aspect ratio is the best way to consume cinematic content. LG G6 embraced this idea and implemented it in its LG G6 smartphone. It's all start with a distinctive 18:9 aspect ratio display, which LG calls FullVision display. This is a 5.7-inch QHD display with a pixel resolution of 2880 by 1440. Jsut in comparison, a 2K/QHD display has a resolution of 2048 by 1080 pixels. This resolution became a standard in man high-end smartphone in 2016. I think it's great that LG dared to take a completely different approach and revolutionize the fundamental experience relying on that aspect ratio of the G6 display. 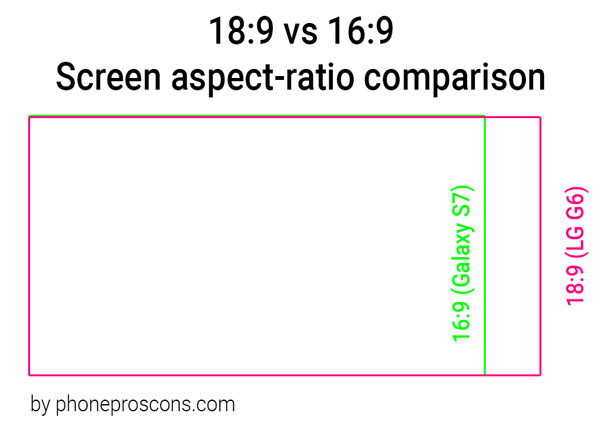 This 18:9 aspect ratio also allowed LG to offer a big screen while still maintaining a smaller body. Just a quick note: any content designed for 16:9 resolution can easily be viewed on a 18:9 format, the LG G6 does support it. To if you play games and watch movies meant to be played in 16:9 aspect ratios, you will have no problem viewing them on the G6. However, there is going to be more and more content tailored to 18:9 screens. 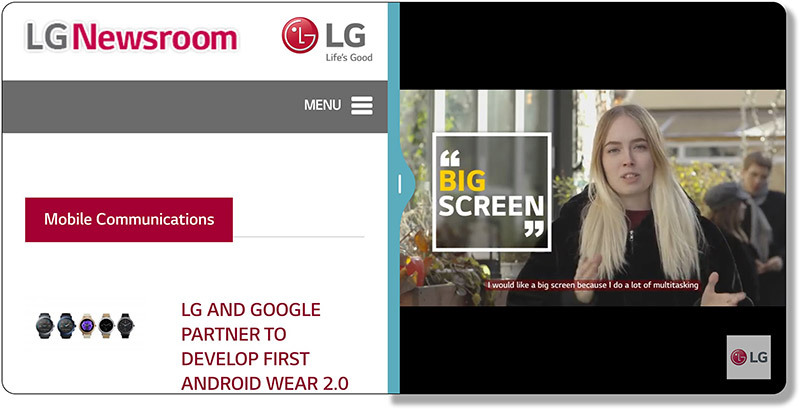 I think that after LG introduced this screen in its G6, we are going to see many more companies follow this approach and hopefully media creators will respond accordingly. Again, it's not a disadvantage, because you can still consume 16:9 content without a problem, so no incompatibility issues. The LG G6 comes with a new mobile UX 6.0, which is designed from the ground up to seamlessly blend and work with the accompanied display and its unique aspect ratio. As you can see in the image above, you can cramp two perfect squared windows at the same size into the screen. This allowed LG to revolutionize the user interface by taking advantage of the extra vertical space that this aspect ratio brings with it. In the illustration above you can see how the 18:9 aspect ratio compared to the 16:9 one. I just took a rectangular shape in Photoshop of the Samsung Galaxy S7 and one from the image above from the LG G6. I resized both to match the same size. You can clearly see that the 18:9 maintains about the same width, but adds more vertical space. 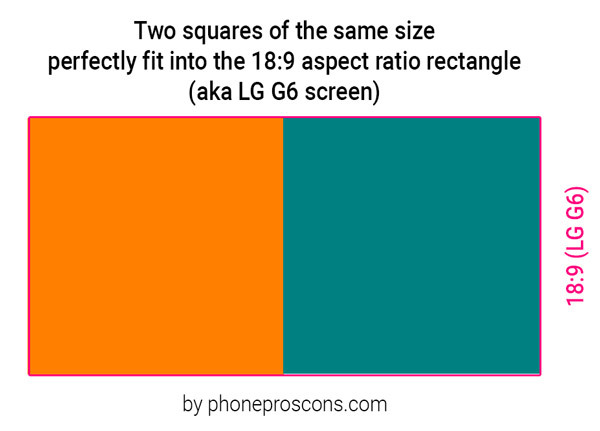 Here is another image that I made that shows that two squares of the same size perfectly fit into the 18:9 aspect ratio rectangular shape (aka the LG G6 display). You can now clearly see why the fuss is about this 18:9 aspect ratio and why LG has decided to a screen with that aspect ratio in its G6 smartphone. Everything from the basic UX design to the square shooting mode of the camera app, all was designed to take advantage of this unique screen. In that unique shooting mode, the camera app can capture 1:1 format images and you can get to review the previously taken image as you shoot. One window shots a real-time preview of the scene, the other a preview of the previously shot photo. Here is a cool promotional video that LG has published on their official YouTube channel, teasing the new UX of the LG G6. Looks really cool, isn't it? To be honest, it's really cool that the 'Square' go back to be popular with all that roundness hype in the mobile UX industry. Microsoft tried to do it with its Metro UX, but people didn't like it. I think what was needed is a 18:9 display to make it happen. Of course it doesn't mean that the UI will look like Windows Metro one, not at all. The UX just take advantage of the fact that two windows can fit into the screen and use that to promote better multitasking experience. For example, you can view a calendar while surfing the web. LG has mentioned a few examples in the press release of the new UX for the LG G6, but I'm sure there is a lot to it. The whole idea behind this 18:9 screen and GUI is to improve the usability when consuming mobile content and make multitasking easier, close to what we experience in desktop computers. Mobile phones are just not suitable for overlayed windows. Even when I work on my laptop and with a second display I put the windows side by side, never one on top of the other. This makes multitasking much more convenient, and I this will work well on mobile as well. This is a great advantage of the LG G6 and a feature that will make it unique among the other high-end devices that will be released in 2017. I think that by the time those screen will have enough content available for them, you are going to have a much larger selection of devices that use this type of display. As for now, I think it's not urgent or necessary to have one.I think that LG should have put more emphasize and invest on other features. Most of the show they talked about the display. I don't think that many people care about that, I know I wasn't convinced by it.